If there’s anything better than a glass of good wine, it’s a glass of good wine with its perfect food partner. From cheese to chocolate – even popcorn and cupcakes – here are some of our favorite food and wine-pairing experiences around the Napa Valley. Most of these experiences are available by reservation only, so plan ahead. If you’re all about the garden-to-table experience, this intimate Sunday brunch begins with a tour of the sensory garden led by Round Pond’s winery chef. With the morning&apos;s garden fresh vegetables in hand, you’ll go into the kitchen for a cooking demonstration and a wine-pairing discussion. Allow four hours on Sundays at 10am. $175 per person. For the Oakville Trek experience, you’ll enjoy an introductory wine and food pairing, following by a tour of the culinary gardens, production facilities, and extensive wine caves for barrel samples. Then you’ll participate in a series of custom food and wine pairings from the winery chef to complement a selection of current wines. $70 per person for up to four guests. Parties of five to 12 are accommodated in a private tasting salon at $85 per person. Allow 90 minutes. This Spanish-owned winery in Carneros offers eight different food and wine pairings, including Tapas & Wine, a pairing of small bites with artisanal, small-production wines ($60 per person); the Caviar and Tulip Tasting Experience, an aromatic flight of four wines served in tulip glasses, paired with a Tsar Nicoulai American White Sturgeon caviar plate and served with potato crisps and crême fraiche ($75 per person); or Chocolate Indulgence, Artesa’s finest red wines with five hand-picked chocolates from local Kollar Chocolates ($60 per person). Here’s a fun idea for a romantic getaway, a girls’ weekend, or bridal shower. Liana offers a pairing featuring four mini-cupcakes from local bakery Kara’s Cupcakes that perfectly complement four Liana Estates wines. Combinations include Bubbles Club Rose with a Red Velvet Cupcake, 2015 Vintner’s White with a Sweet Vanilla Cupcake, a 2015 Chardonnay with a Banana Caramel Cupcake, and a 2014 Pinot Noir with a Fleur de Sel Cupcake. Or try the Bubbles and Popcorn Pairing – the perfect combination of sweet and savory. There’s Bubbles Club Brut with Truffle Mushroom Popcorn, Bubbles Club Blancs de Blancs with Caramel Popcorn, and Bubbles Club Rose with Dark Chocolate Popcorn. Both pairings are offered daily, $50 per person or $60 per person for groups of six or more. You can sample seasonal small bites paired with a selection of Peju’s current-release wines. Because the menu changes frequently based on the season, you should call ahead to inquire about the week’s menu. Peju&apos;s Wine and Culinary Exploration is offered on Thursdays, Saturdays, and Sundays at 10:30 am and 1:30 pm. It’s founder Dave del Dotto’s belief that wine tasting should be a complete sensory experience, so food and wine pairings are at the heart of Piazza Del Dotto in Napa. Visitors can choose from two pairing experiences: Poppers features a selection of five wines paired with savory bite-sized treats (45 to 60 minutes, $60 per person). And Delicacies is the premium tasting of six to seven wines accompanied by savory small plates finished with a port and cheese or dessert pairing (90 minutes, $95 per person). This winery, located on Sundance Ranch in Calistoga, focuses on crafting small-lot wines and training high-performance Arabian horses. With its Signature Reserve Wine and Cookie Pairing, you’ll be guided through a selection of its wines while being led on a tour around the winery and equestrian ranch. Tuesday through Thursday, 90 minutes, $60 per person. You can taste the Pomerol-inspired wines of Blackbird Vineyards, by renowned winemaker Aaron Pott, with a curated Morimoto Napa bento lunch including steak teriyaki, a selection of sushi, seasonal vegetables, salad and tempura. It’s hosted in Riverhouse’s downtown Napa gallery overlooking the Napa River, where guests are surrounded by the sculpture, paintings, and objets d’art of ӔRENA Galleries & Gardens. Offered daily, $95 per person. Best known for the methóde traditionnelle sparkling wines and Pinot Noir grown from its estate vineyards, Domaine Carneros invites guests to cozy up in its salon to enjoy handcrafted sparkling and still wines paired with savory local artisanal cheeses and other bites. In its Ultimate Chips & Dip experience, you’ll sample three estate wines with three half-ounce servings of Tsar Nicoulai Caviar’s finest artisanal caviars, accompanied with gourmet potato chips, toast points, and crème fraiche ($350 per couple). In the Connoisseur’s Tasting, for 2 to 12 people, you’ll receive a brief introduction by the wine educator, a tasting of six premium wines selected according to the interests and tastes of you and your guests, artisanal cheeses, smoked salmon, and other savories to complement the wines ($95 per person). The new Joseph Phelps Culinary program lets visitors savor seasonal cuisine paired with the latest wine releases in a dining room overlooking estate vineyards. “Playful Plates” is an interactive food and wine pairing experience in which guests can enjoy a flight of five wines, including Insignia, paired with seasonally inspired bites. Offered Wednesdays at 11 am, Thursdays at 11 am and 2 pm, and Saturdays at 11 am. $195 per person. Held in Cellar 47, an intimate VIP tasting venue located within its caves, the guided experience includes tastings of five estate Cabernet Sauvignon wines, each expertly paired with small bites prepared by the winery chef. Held daily at 11 am and 1 pm, $125 per person. 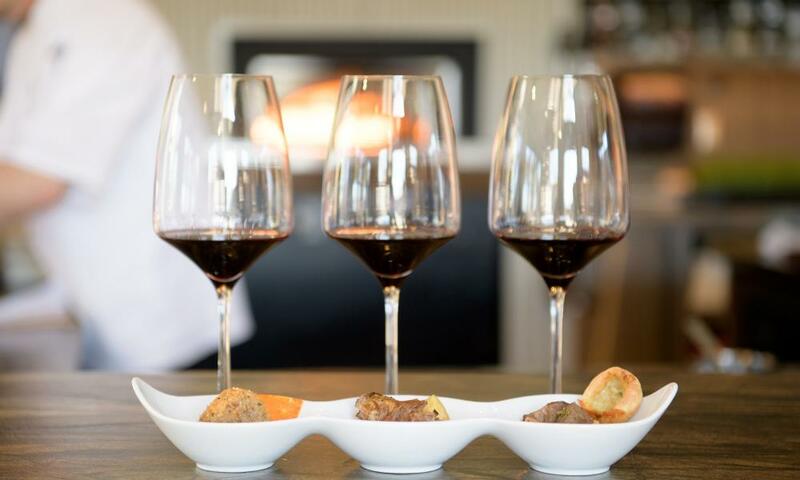 During Sterling’s Platinum Tasting Experience, you’ll taste a flight of four small-production reserve wines paired with a series of sensational amuse-bouches. The Platinum Experience includes a vertical of the winery’s most prized Cabernet Sauvignon in one of its galleries. A typical offering might include coriander and cardamom-roasted winter squash; duck confit with fresh sage; a lamb meatball; leek and fennel tomato sauce; cheese crisp and parsley; and a braised beef short rib and carrot thyme purée. Available Thursday through Sunday, one hour, $75 per person. This Napa winery features a range of food and wine experiences. The Tour of the Palate includes a guided tour of the Hess Collection Art Museum, featuring works from Donald Hess’ private collection, and pairing of three current release wines expertly matched with three culinary creations from the Hess Collection’s executive chef (daily at 2pm, $95 per person). There is also a Tour with Wine & Cheese Pairing (daily at 11:30 am and 3 pm, $75 per person); a Tour, Wine & Chocolate Indulgence (daily at 3:30 pm, $65 per person); and the Hess Experience Tour & Luncheon (daily at 11 am, $165 per person). Here your group can participate in the Cabernet Culinary Challenge – a local spin on a Food Network challenge. Guests taste Sequoia Groves limited-release Cabernets while receiving an education on pairing that varietal. Teams are then formed to compete in creating a crostini that best pairs with the Cabernet. Each group is given a bottle of Cabernet and a platter with 20 different toppings to create their winning crostini. Each entry is then judged to determine the winner, and prizes are awarded to the winning group. Apparently the competition gets pretty fierce! By reservation only, eight-person minimum. $100 per person.